Lemon lime marmalade is fabulous but it’s difficult to find in stores. And when you do it’s generally a little pricey. So why not make your own? It’s not only cheaper, it’s tastes a lot better too! 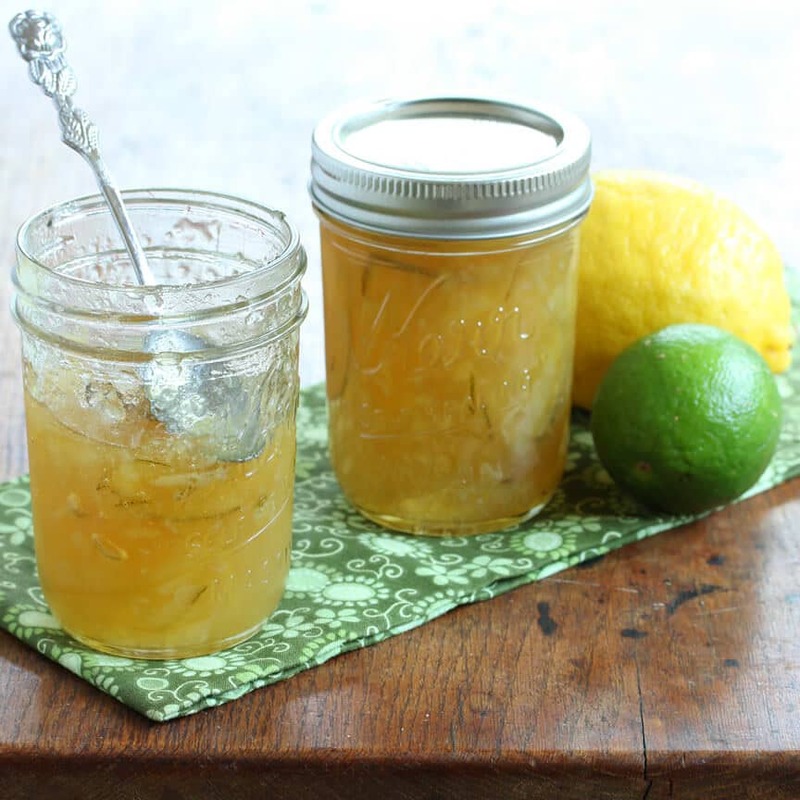 The question on your lips may be, “And why would I even want to make lemon lime marmalade?” Well, if you’re a citrus nut like me, this is right up your alley. It’s like citrus on steroids. And because there are so many great ways to use it beyond merely spreading it on toast (which is good, of course, but requires no imagination). 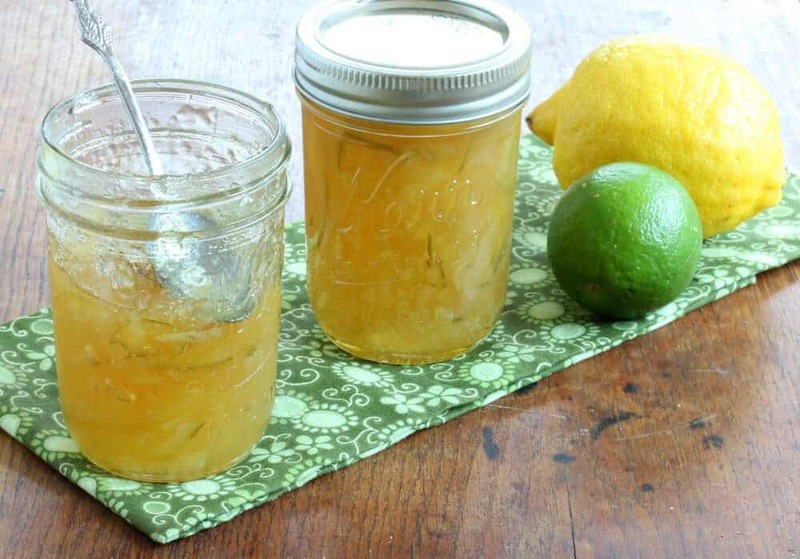 Few things rival the wonderful flavor of lemon and lime and those are just a few ways you can put this fabulous Homemade Lemon Lime Marmalade to use. A note about the rinds. You can use the lime rind whole but the white pith of the lemon is very bitter. You can use it as well, but just a heads up. If you prefer it less bitter, remove the white pith of the lemon and only use the outer yellow part. For the demo pictures below I have left the white pith intact. Also, citrus is sprayed and waxed and since we’re using the rinds I recommend using organic lemons and limes. 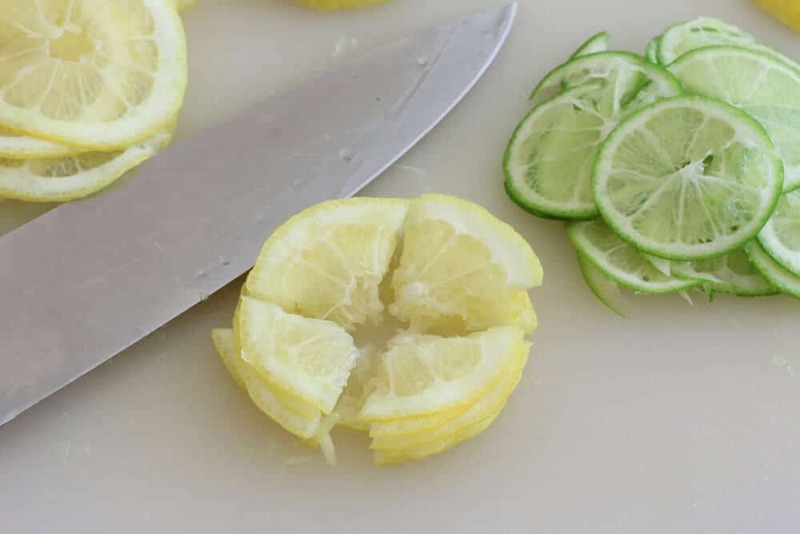 Cut off the very ends of the lemons and limes. Very thinly slice the lemons and limes. The easiest way to do this – and to do it quickly – is to use a mandoline slicer. Remove any seeds. Add the citrus to a medium-sized pot with the water and bring to a boil. 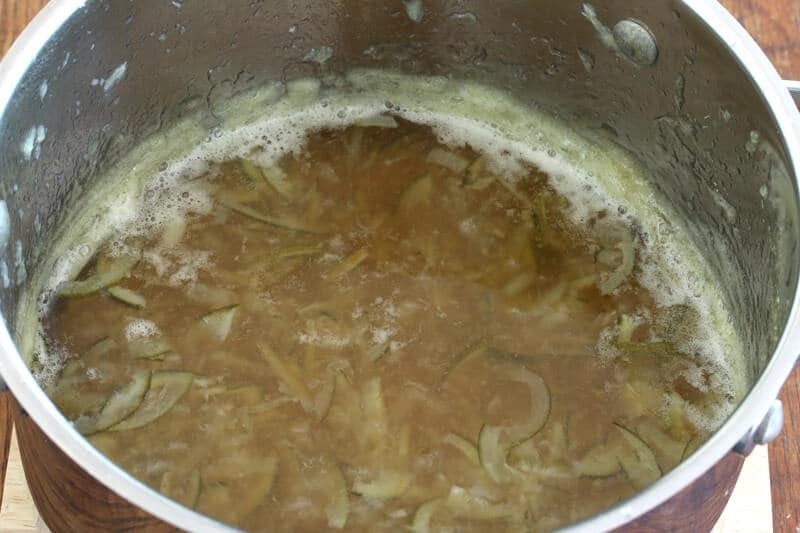 Reduce the heat to a steady simmer and simmer for one our until the citrus is very soft. Give it an occasional stir. Add the sugar and return to a full boil. Reduce to a steady simmer and simmer for another 20-30 minutes or until a candy thermometer reaches 220-225 degrees F. Using a candy thermometer will ensure proper results and makes the job easier, plus they’re relatively inexpensive. I highly recommend buying a candy thermometer. 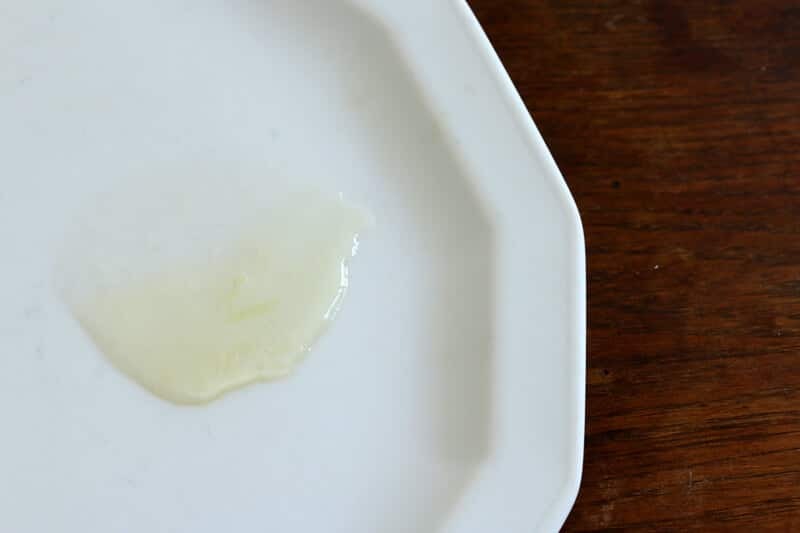 If you’d rather not get a candy thermometer you can use the “plate test.” Simply place a plate in the freezer for a few minutes and then place a dab of marmalade on the cold plate. Tilt the plate to see if the marmalade is set. If it’s too runny, it’s not ready – continue simmering. If it congeals into a soft gel and only moves just a little, it’s ready. Let the marmalade sit for 2-3 minutes, then skim the foam off the top of the marmalade and discard. Letting it sit will evenly distribute the citrus pieces so they don’t float to the top when you place the mixture in your jars. Pour the marmalade into hot, sterilized jars leaving 1/4 inch headspace from the top. To be extra safe, process the jars in a boiling water bath for 5 minutes. Keep the marmalade stored in a cool, dark place. It will keep for at least one year. Cut off the very ends of the lemons and limes. Very thinly slice the lemons and limes. The easiest way to do this - and to do it quickly - is to use a mandoline slicer. Quarter the slices. Remove any seeds. If you'd rather not get a candy thermometer you can use the "plate test." Simply place a plate in the freezer for a few minutes and then place a dab of marmalade on the cold plate. Tilt the plate to see if the marmalade is set. If it's too runny, it's not ready - continue simmering. If it congeals into a soft gel and only moves just a little, it's ready. Let the marmalade sit for 2-3 minutes, then skim the foam off the top of the marmalade and discard. Letting it sit will evenly distribute the citrus pieces so they don't float to the top when you place the mixture in your jars. Pour the marmalade into hot, sterilized jars leaving ¼ inch headspace from the top. To be extra safe, process the jars in a boiling water bath for 5 minutes. Keep the marmalade stored in a cool, dark place. It will keep for at least one year. *A note about the rinds. You can use the lime rind whole but the white pith of the lemon is very bitter. You can use it as well, but just a heads up. 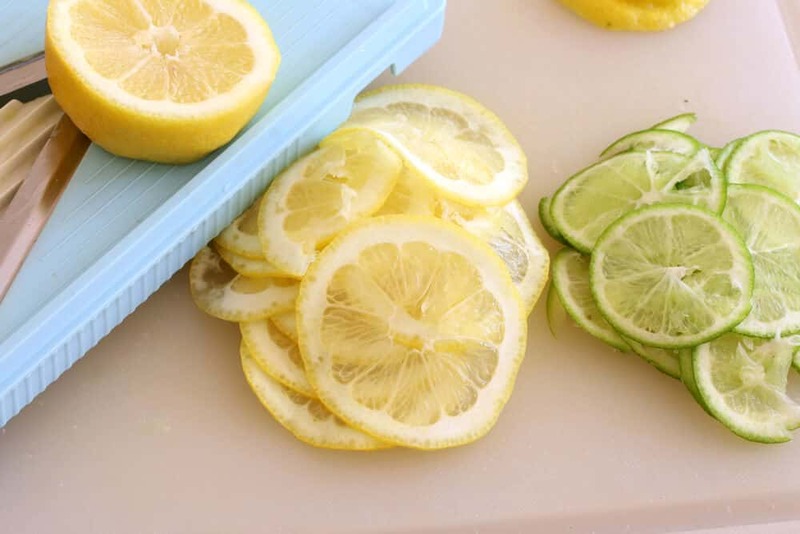 If you prefer it less bitter, remove the white pith of the lemon and only use the outer yellow part. For the demo pictures below I have left the white pith intact. *Also, citrus is sprayed and waxed and since we're using the rinds I recommend using organic lemons and limes. Looks great and wonderfully explained as usual. 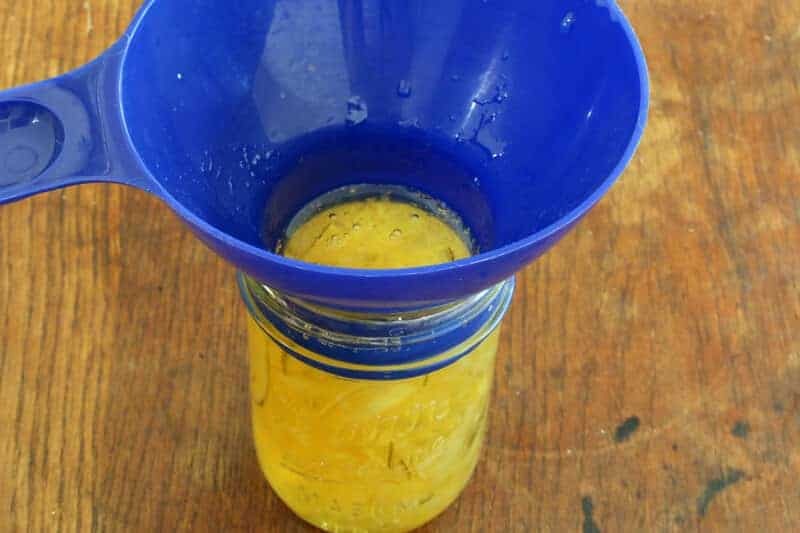 I like the blue thing you use to fill the marmalade in the jars, I have to look for something like that to reduce the mess I make when filling the jars. Do you have a German name for it? Thanks, Adina :) The blue thing is a canning funnel, or “Trichter” in German. I’m not sure if that’s what this particular item is actually called in German though. Hopefully you’re able to find it. This sounds *wonderful*, will definitely be trying this! Thanks also for all the great ideas of how to put it to delicious use! Oooh, I love anything with citrus! I’ve had orange jam before but never lemon or lime. I’ve no doubt I would love this! There is absolutely no need to use a water-bath for this type of preserve, the sugar will keep it safe. We never water-bath things made with sugar here in UK. Toffeeapple, being from Europe myself where the water bath method is never used for jams/marmalades, I agree with you. I’m simply including these recommendations per the USA’s FDA guidelines. Reading your instructions to slice the fruit and then remove any seeds took me back to the first time I made tangerine marmalade – using my new Cuisinart to slice the to 2mm thickness. It multiplied the number of seeds exponentially… This recipe also took me back to missing my lemon tree that I had when I lived in Southern California. Memories, memories. I like seeing instructions for making jam without using pectin. Not sure I’ll make this, but I’m definitely glad to know how. Haha, that’s hilarious, Susan! I can just imagine you spending an hour trying to pick out all the slivers of seeds and finally throwing in the towel :) I wish so much we had a lemon tree. The new home we’re buying has a big greenhouse and I’m hopeful to be able to grow one in there along with an olive tree we recently brought back with us from Sonoma. Hello , i am making Marmalade as we speak , 4 Meyer lemons and 2 limes, 6 cups water and 7 cups of sugar and it tastes bitter , I was blaming the Limes ? I hope I can rescue this. last week I made Lemon marmalade with vanilla, no bitterness, same bag of Meyer lemons. vanilla bean not available to me but a scant teaspoon of pure vanilla essence was used, smells like vanilla but tastes like lemon marmalade, different. 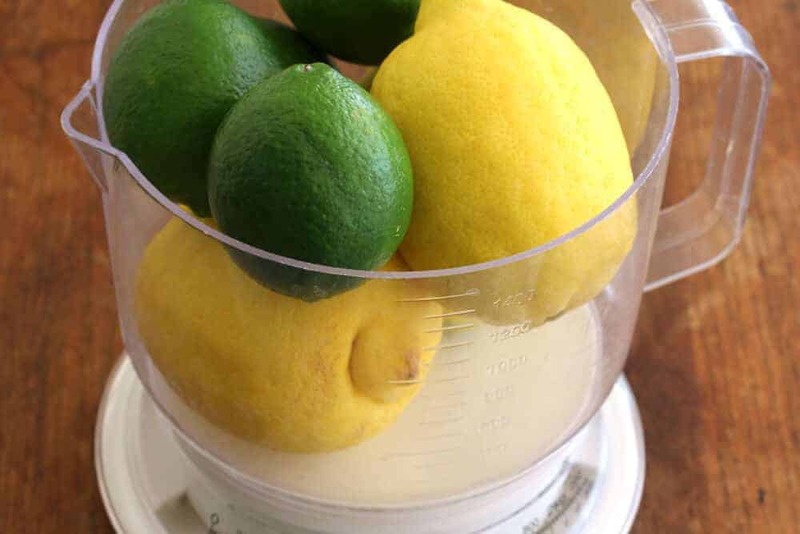 do you have any helpful hints when using a grapefruit along with lemons. Hi Janet! The limes alone wouldn’t explain the bitterness. If anything lemons tend to be more bitter than limes. Did you remove the white pith from the citrus? That’s what causes most of the bitterness. If you didn’t remove it then there’s really nothing you can do about this particular batch. But even if it’s too bitter to enjoy with bread, it will still be great to cook with (see some of the ideas I mention in the post). For the grapefruit, you would prepare it exactly the same way. Grapefruit marmalade is marvelous! A wonderful, straightforward and delicious recipe. I am making my recipe with 3 gallons of sliced, frozen (mostly limes) from my daughter’s garden wedding last summer. The limeade for 500 guests was difficult to estimate…we found that we could buy wholesale boxes of citrus for a fraction of the cost of buying them by the pound. 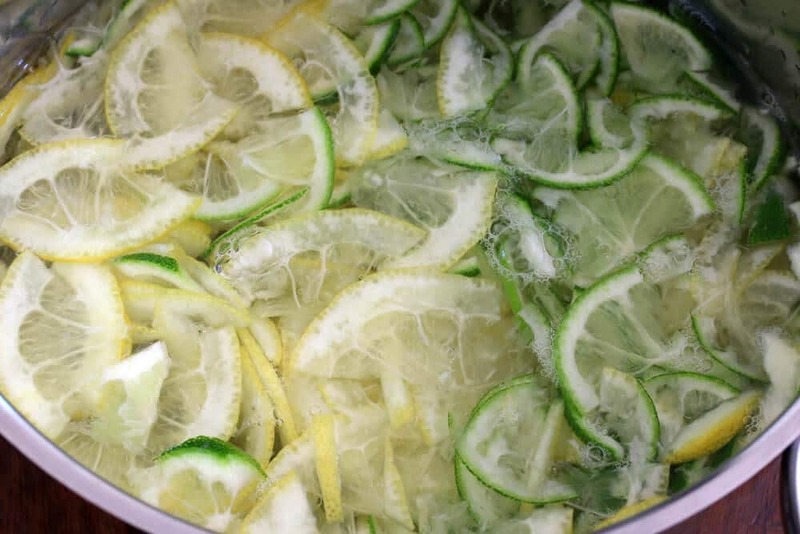 A wise and frugal helper realized that the many extra limes and lemons would be better used thinly sliced, seeded and frozen- which she quietly did as the garden party proceeded. We have enjoyed cooking and flavoring drinks with the slices, but they are needed to be used up! This recipe is wonderful in baked goods- ‘cinnamon’ type rolls, etc. Fun to remember a wonderful wedding while eating marmalade! That’s a fun predicament, David! :) I’ll bet you’ve been making lots of yummy things with those leftovers. The great thing about marmalade is it will last a very long time and I’m sure you know lots of people who’d love receiving some as gifts, too! I was looking for recipes to use up lemons and limes when I read your post David and couldn’t believe it – our daughter was married last Saturday and we have also ended up with more lemons and limes from the reception drinks than we know what to do with (the result of kind but over zealous helpers dispatched to Sainsbury’s to replace the fruit we had forgotten). I’d started slicing the limes to freeze for drinks but your idea is much better. I love your note that eating this marmalade brings back memories of the wedding. Beautiful. If the temperature here in the UK ever drops below 28degreesC I’ll get my preserving pan out and give this a go. Two days ago I pruned my savage (thorny) lime tree and ended up with a large bowl of limes. I have just made this recipe and it tastes a little bitter (no lemons) but I believe it will be amazing with curries and on toast. Thank you. By the way, I didn’t remove the pits from the limes. I guess they will come back to haunt me. I made this for my first ever attempt at marmalade. It brought back wonderful memories of having my nana’s marmalade as a little girl. This tasted fantastic & all my friends love it too. Thank you for inspiring me to make my own preserves. That’s wonderful, Nicky, I’m so glad it was a hit – thank you! Wonderful marmalade – made it – friends tried it – recipe in demand. Great for those who cannot tolerate grapefruit. Instructions very clear – very easy to make. Thank you. Fantastic, Jenny, thanks so much! I make mine with limes only…..I have a lime tree loaded with fruit. Very tart and an absolute winner, I have had professional chefs comment on how yummy it is and want the recipe. Thanks so much for sharing. A lime-only marmalade sounds delicious too, Chris! Our marmalade is simmering as we speak! Slicing a pound of key limes and Meyer lemons was a chore, but the product smells delish! Looking forward to tasting it. Thanks for the recipe! My friend, Wendy forwarded it to me. Dear Kimberly, I was looking for receipes to use up my squeezed limes. I put them in Ice Cube Trays and froze them. I have bags full of cubes. Using them for jelly would be great! I used all the lemons, the tree is loaded with flowers again, so is the lime tree. How can I measure use the frozen cubes to make a jam? Hi Dorothy, the limes were squeezed and then frozen whole? Simply thaw and drain them, then weigh them to get the amount the recipe calls for. It has been suggested to me, as gin is so popular at the moment, to reduce the amount of water and add gin to it so I’m going to try that. I was just looking for a good lemon and lime recipe. I’ll add it at the end as I do when I’m making whisky marmalade. Fantastic, Catherine, let us know how it turns out! Hi. I have made two batches of this marmalade to sell on my stall at the produce market along with my other goodies I make. That’s terrific, Nanny, I’m so glad it’s been a hit and appreciate the feedback! Hi Lee, greetings to NZ! The reason you don’t need the pips or any added pectin in this marmalade is because of the length the sugar simmers: Once it reaches 225 degrees F it will set. You can use a candy thermometer to check the temperature but using the plate test as noted in the recipe also works great. Hi Jenn, yes it can, that will only alter the shape of the pieces, not the flavor. Enjoy! Please clarify the method of removing the pith–is it done before or after cutting into quarters. 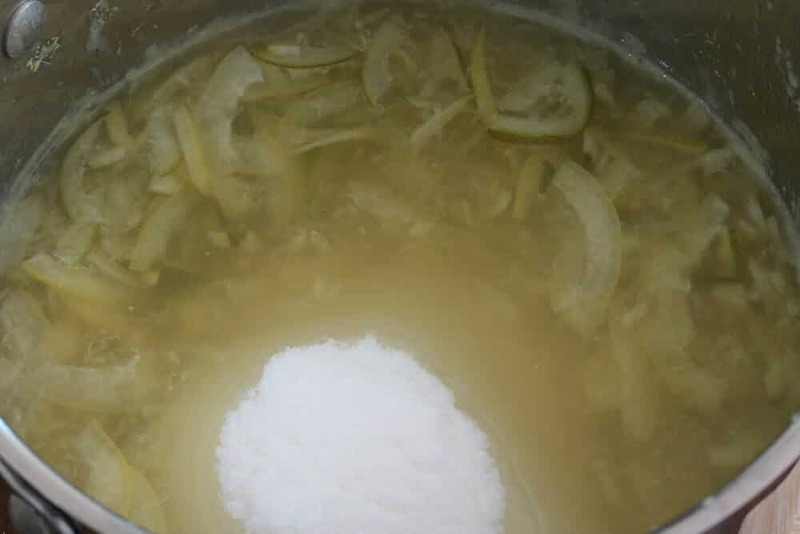 I’ve been in search of a lemon, lime or lemon/lime marmalde recipe for a while, and this looks perfect, except for the pith part which seems to be confusing to me. I would appreciate more instruction. Hi Arleen, it really doesn’t matter how you remove it as long as it’s removed before cooking it – use whatever method for removing the pith that is easiest for you. Sorry, I’m new at marmalade. So it really doesn’t matter when the fruit is cut away from the peel–is that okay? I assumed it was more necessary that the quarter slices needed to be somewhat more intact. Hi Arleen, yes that’s correct. Nor does it matter how large the fruit pieces are, it’s all personal preference. I also,want to try this recipe and was wanting to know how to get rid of the lemon pitch. When cut into quarters, do you then cut the rind off and cut the pitch off leaving the Lemon skin then put the fruit and pith into saucepan ?.. Hi Helen, yes, just cut the white part off (as much of it as you can anyway, you won’t be able to remove it all) and use the outer yellow part, discard the white part. Hi Janet, sugar begins to caramelize when it’s cooked for a long time, so that’s my guess as to why it’s dark. If it’s bitter it sounds like you left the white pitch of the citrus rind on – that will make it bitter even without overcooking it. Runniness: It will be runny while it’s still hot/warm. Once it has fully cooled down it thickens. I used this as a guideline to make both line marmalade (no lemons) and a cinnamon-Mandarin orange marmalade. I only used about 5 cups sugar and maybe a half cup marmalade on the lime, and 3 cups sugar and a half cup honey on the orange. They came out great, and I love how the peels taste like candied citrus. My husband ate the peels from the discard like candy, lol. One thing though is that it took way longer than the recommended amount of time to get to the right temperature. They boiled for nearly an hour and a half before I added the sugar, and at least an hour longer after. Thanks for the feedback, Amber, and that cinnamon-mandarin orange marmalade sounds heavenly! Thanku ,yesterday I had very dark and bitter marmalade, I threw it out and started over today. It turned out great this time, thanku! any idea what you may have done differently this time? Also, marmalade can take a full day for it to set. If it’s been a day and it’s still too runny, at this point I’d recommend keeping the marmalade refrigerated until you can get hold of some pectin and then add the amount specified on the pectin package to the marmalade and bring it back to a boil per package directions. This was a great recipe and my marmalade set perfectly for once. I used 2 Kaffir limes which I grew, 1lb of Key limes, and about 6 ordinary limes. I put the Key limes whole into a muslin bag for the boiling in water part. Before adding the sugar, I took the bag out and sliced the limes in half. I scraped out the insides + seeds. Then sliced the peels and put them into the pot. I have a feeling that being very seedy, the Key limes helped this batch to set well. I used 6 cups of sugar. I lightly boiled with sugar for about 40 minutes and let sit as directed before putting the marmalade into the jars. It has a very fresh taste and a wonderful tang. And as I said it set beautifully. When you bite into a Kaffir slice you can really taste that wonderful aroma. Thank you so much for such a great recipe that turned out so successfully. Thanks for all the info, James, and I am totally envious of your Kaffir lime tree! You may be able to grow a Kaffir lime too. I live in Massachusetts and mine only goes outside after the danger of frost has passed. Last year was the first year I fertilized it every week. Having it flower and produce fruit was a huge surprise. Hi Janet, that’s common when marmalade is opened and then stored in the fridge for a while – it’s sugar crystals forming on the top as a result of liquid evaporating. You can fix the problem by rewarming the marmalade either over the stovetop or in the microwave to melt the sugar. Great recipe! Scaled it up to match 5kg of fruit, ending in 17 jars of delicious marmalade. My fruit was entirely limes, but the modification produced just as good results as the other comments reflect. Fantastic, Simon, I’m so glad – thanks for the feedback! Made this recipe yesterday and it turned out beautifully. The marmalade is a little on the tart side but not biitter. Would recommend the recipe to anyone with excess lemons and limes. I’m so glad to hear that, Sharyn, thank you! Hi Lupe, absolutely it’s perfectly safe. Using it as a dipping sauce is a great idea and you can also stir it into other sauces to curb the bitterness or add a spoonful or two to baked goods (muffins, cakes, etc) for an added boost of citrus flavor. There are still plenty of uses for it! Do you remove the white plinth from the fruit before putting in the pan. And then do you put into a muslin. Hi Carita, yes, remove the white pitch before you add the peels to the pan. Discard the pitch, don’t simmer it with the marmalade or it will make it bitter.